UPDATED 1980's LAKEHOUSE ! This one has it all. Remodeled kitchen & Baths. 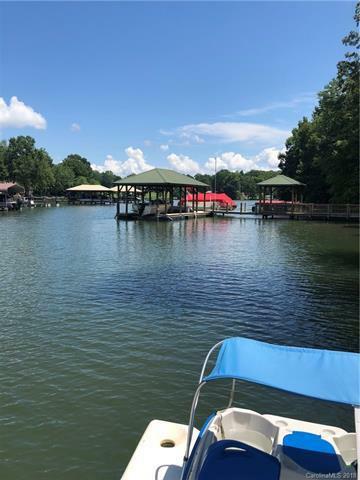 Enjoy the Lake life with large dock, 2 slips, and 2 boat lifts. Dock area and cove have been dredged to 12 ft at full pond for deep year round water. Pathway lighting leading to the Backyard with room for entertaining. Lower level master suite has been updated, featuring Tile, granite, duel sink vanity and glass enclosed shower in master Bath. Covered lower level porch with hot tub. Main level has wrap around deck, perfect for the summer cookouts! Glass enclosed sun room, tile flooring, and sliding walk out to the deck. RV pad with power and water. This property is being used as a profitable vacation rental. ask LA for details. This property is just a short distance to the main channel,you don't have to go under any bridges to get to the main channel, also near 3 marinas. House is already set up for the new buyers to have a good rental income. Listing information © 2019 Triad MLS, Inc. of North Carolina. All rights reserved. The data relating to real estate for sale on this web site comes in part from the Internet Data Exchange (IDX) Program of the Triad MLS, Inc. of High Point, NC. Real estate listings held by brokerage firms other than RE/MAX Impact Realty are marked with the Internet Data Exchange logo or the Internet Data Exchange (IDX) thumbnail logo (the TRIAD MLS logo) and detailed information about them includes the name of the listing brokers.IDX information provided is for consumers' personal, non-commercial use and may not be used for any purpose other than to identify prospective properties consumers may be interested in purchasing. Information deemed reliable but not guaranteed. Data last updated 2019-04-25T06:31:32.41.